Dogs and cats, just like humans, lose all of their baby teeth as they grow up. Technically known as deciduous teeth, these baby teeth usually fall out on their own between the ages of three and six months. Some pets continue to lose their baby teeth until they are around nine months. The process is slightly different for each pet. For example, dogs that are big chewers might lose their baby teeth faster because the chewing helps loosen them up. Cats and dogs that don’t love to chew on bones might take a bit longer to lose their deciduous teeth. Although it might be important to note that puppies tend to become avid chewers when they’re losing their baby teeth since the chewing actually helps relieve the discomfort and pain. Owners often don’t realize that teeth are coming out because a lot of pets simply swallow them. This is perfectly normal and you shouldn’t be concerned whether you find teeth or not. Still, you might find a few teeth here and there, such as stuck in a toy or chew or even near your pet’s bed. Once your pet starts losing his baby teeth, keep an eye on his gums. There should be just a little, if any bleeding. Healing is usually very quick and the gums often appear pink and mildly swollen in most pets. You may notice a strong metallic odor to your pets breath while they are losing teeth due to the bleeding and inflamed gums. Dogs have 28 baby teeth, while cats have 26 to lose, which is why it takes several months for the process to be over. Front incisor teeth tend to fall out first, with canines and premolars coming out later. Unlike people, dogs and cats do not have deciduous molars, but they do erupt adult molars. Dogs normally have 42 adult teeth and cats have 30 adult teeth. Many pets lose their baby teeth on their own without any issues. This occurs as the adult tooth near the base of the baby tooth begins to erupt and causes the root of the baby tooth to resorb and eventually fall out. The adult teeth become trapped under the gum leading to a painful dentigerous cyst within the jaw bone. The cyst can weaken the jaw and lead to fractures or infection. It can also cause problems with adjacent teeth leading to displacement and additional tooth loss. Retained baby teeth can also cause the adult tooth to grow in next to the baby tooth. These teeth are often tightly squeezed together leading to entrapment of food, debris, and tartar between the teeth. The ultimate result of this is periodontal disease, pain, and likely loss of the adult tooth over time. The adult tooth grows in the wrong position because of the location of the baby tooth in the place it is supposed to grow. This can lead to malocclusion where teeth strike each other or soft tissue around the teeth causing painful sores, inability to close their mouth, fractured teeth, or difficulty chewing food. While any baby tooth can be retained, the upper canine teeth are the teeth more commonly affected by this issue and unfortunately are the teeth most likely to cause problems if not properly addressed. For the best results a retained deciduous tooth should be extracted as soon as it appears that it is not going to fall out normally and any part of the underlying adult tooth is erupting. The earlier the tooth extraction is carried out, the better, because it gives a chance for the new adult teeth to readjust. If you wait too long, the permanent teeth might set in a crooked position permanently leading to pain, infection, and tooth loss. Due to the sensitive nature of the underlying adult tooth and the surrounding teeth, it is imperative that the extraction of deciduous teeth be performed by an experienced veterinarian, which the veterinarians here at Harmony Animal Hospital have extensive training and experience. Generally only 1/4 to 1/3 of the baby tooth is visible above the gum line, meaning that the unseen root is about 2-3 times as long as the crown. It is critical that the entire deciduous tooth is removed since the retained root is the problem and will continue to cause issues if any of the root is left behind. To properly evaluate the deciduous tooth, the adult tooth below or beside it, and to confirm that the entire deciduous tooth root was extracted it is imperative that dental radiographs are performed before and after the extraction of each deciduous tooth. Without dental x-rays it is impossible to predict if there are going to be potential complications or additional issues prior to extraction and to know for sure that the entire root was properly removed post-extraction. All deciduous teeth extractions need to be performed either under heavy sedation or general anesthesia. This will depend on the number of baby teeth that need to be removed, the need to correct other dental problems at the same time, and if the patient is going to have other procedures done at the same time such as a spay or neuter. Post-extraction care of baby teeth is minimal. Most pets feel only a small amount of, if any, discomfort. 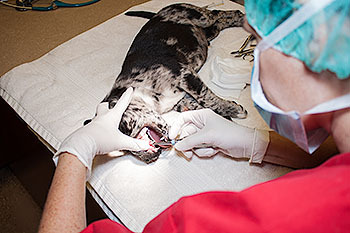 We will let you know if you need to take any special precautions after extraction of your pets baby teeth. We do not routinely send home medications after deciduous teeth extractions, but if your pet has a tooth extracted at the same time they were neutered or spayed, the anti-inflammatory pain medications will be given during surgery and continued at home for a few days to help ease any potential discomfort.